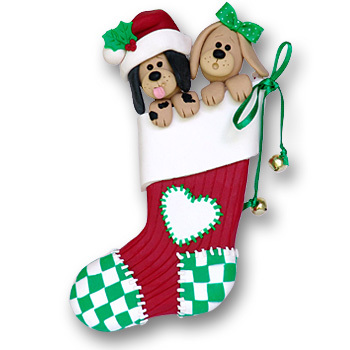 These two puppy dogs are a great gift for a couple, kids, or your furry friends. The ornament is very detailed and is completed with ribbon and real brass bells .May be personalized with two names and a year. It is easily personalized with names on the stocking. Handmade from polymer clay and designed by Debi Allison. Also comes with a hook and satin ribbon for hanging.